Located in a former farmhouse just 6 km from Mont Saint Michel, we offer 2 new self-catering accomodations with full comfort for 2 people. These rentals offer a quiet environment, without vis-a-vis, overlooking the countryside. Functional, modern and warm, enjoy the cocooning atmosphere of these carefully decorated cottages for a relaxing stay. We will give you advice and documentation to discover our region according to your expectations. And to make your stay even more relaxing, we can deliver your breakfast every morning to your cottage. Composition of cottages: living room with fully equipped kitchenette, fridge with freezer, microwave/oven, washing machine, lounge area, sofa, TV, internet connection, closed bedroom with queen size quality bed, bathroom with large shower, washbasin cabinet, hair dryer and toilet. 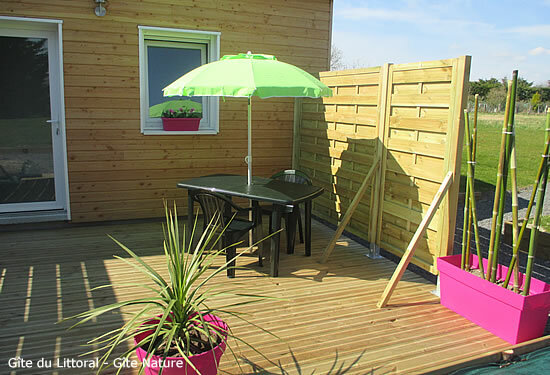 Nice wood private terrace with garden furniture and parasol.